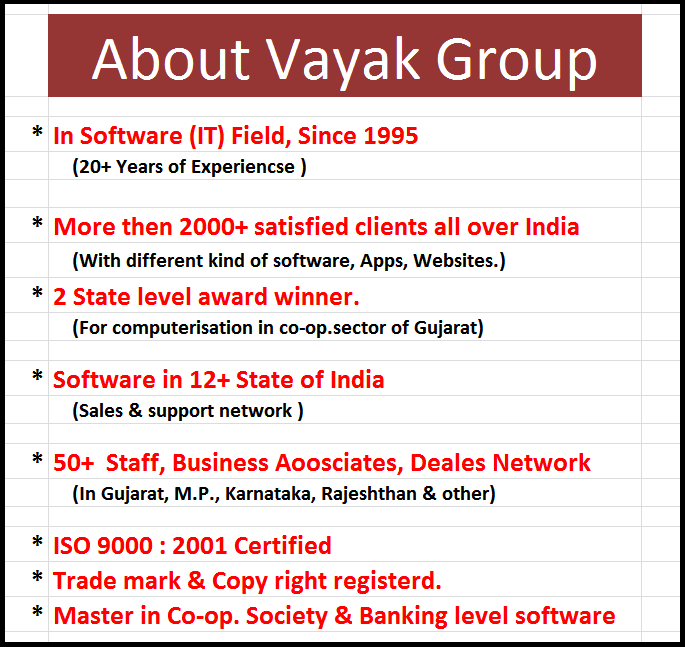 "VAYAK Group" is in the field of Computer Software Development since 1995 in India. It is an International IT Products Development and Services providing Group. we are providing solutions to varieties of fields like computerisation of Co-Operative credit society in india, Staff Management mobile and web base application with gps location tracking and online reporting, Education field etc. At VAYAK, our aim is to offer benefits of Information Technology to different enterprises at high Quality at reasonable cost. To bring the best IT benefits to the Companies & improve their Business Revenue, Productivity and Quality. VAYAK provides the atmosphere to the staff of different companies, so that their talent and skills leads the company towards professional growth. VAYAK will provide faster and cost-effective IT solutions and services to customers in India & make Customers Delight. VAYAK continuously improve its products and services which will meet international standards of Cost, Time and Quality. Today Android Mobile application is the best solution for online and on time working. Vayak's mission is to increase the profit of Companies by providing them online Staff care mobile application. For Employee GPS base location tracking for better productivity and online live mobile base staff reporting. we can call it field work force staff Management software"
Gujarat is the one of the best state in India in the field of Co-op. Sector and in Gujarat about 75% Co-op. Credit and Employees Societies are using "VAYAK" Software. Since 1995, We are the pioneer company in the Co-op. Sector. At present we are providing our client desktop applications, web application like core banking and Android base mobile application for staff and agents. We have our clients in district like Ahmedabad, Gandhinagar, Banaskantha, Baroda, Bhavnagar, Rajkot, Mehsana, Sabarkantha, Patan, Anand, Kheda, Panchmahal, Surat, Valsad, Navsari, Vapi, Junagadh, Amreli, Porbandar, Jamnagar, Kutch, Surendrenagar, Bharuch, Ankleshwer, Narmada, Dang etc. In all the district of Gujarat we are having clients and also our direct on site service and support is available. After Successful computerization of around 750+ clients in Gujarat we have got so many inquiries from all over India. So we have started expanding our strength in respect. At presently we are working in Gujarat, Rajasthan, Maharashtara, Andhrapradesh, Karnataka, U.P., Utakhand, Orissa, Chattisgarh, Madhyapradesh, Bihar & Delhi. At presently We are having so many clients in these states of India. It's our pleasure to say that recently we have started our work out side India also. They are using our English software and taking on line service support from our call center. Due to on line internet support system by call centre world becomes small and distance becomes less. By this way giving service in India is a very easy and quick task for us. We are having on line internet base support team at our office. This team is supporting our clients on line with the help of Ammyy and teamviewer. With this kind of software our call centre staff can view and operate computer's screen from our office and can solve the problems easily and quickly.